Morton Broffman was a Washington, DC-based photographer whose social conscience and commitment to civil rights informs his work. 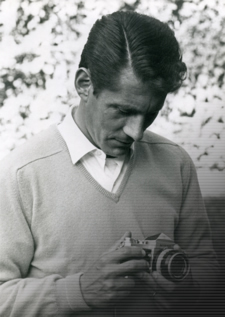 Broffman died in 1992 of ALS and left behind a significant archive of images taken while covering the American Civil Rights Movement, and the political and social changes of the 1960s, 70s and 80s. During his lifetime Broffman's work appeared in many of the major US publications as well as in exhibitions. Infused in his images is a keen sense of the bonds that link us together. Broffman had a deep love of people and his work explores man's search for common ground. The High Museum of Art in Atlanta acquired a group of 33 vintage Morton Broffman Civil Rights prints for the museum's permanent collection and for inclusion in the exhibition "Road To Freedom: Photographs of The Civil Rights Movement 1956-1968". The exhibition has had highly acclaimed runs in Atlanta, The Smithsonian, The Field Museum, The Skirball Cultural Center and is currently on display at The Bronx Museum until August 11, 2010. Information about The Bronx Museum exhibition is available here. Broffman was also the principal photographer for The Cathedral Age magazine, published by the Washington National Cathedral. The Broffman archive contains tens of thousands of photos taken during the most exciting phase of the National Cathedral's history: the final 30 years of its construction. It is the most comprehensive source for National Cathedral imagery available anywhere. A soaring collection of Cathedral construction, artisans, musicians, politicians, and world leaders. Broffman's photos of the stone carvers of the National Cathedral were featured in the 1984 Academy Award Winning documentary, The Stone Carvers. Atop the Cathedral is a stone gargoyle. In its mouth is the carved image of a photographer, his camera capturing the decisive moments below. The photographer is Morton Broffman. The images on this site are a small selection of the photos Morton Broffman took over a 35 year period. Where noted the photos are scans of vintage gelatin silver prints. The Broffman family welcomes inquiries from collectors. Gelatin silver prints made from original negatives in the archive are also available. A small gallery of National Cathedral images will be on-line soon.